This one is really about the Sriracha Mayonnaise. 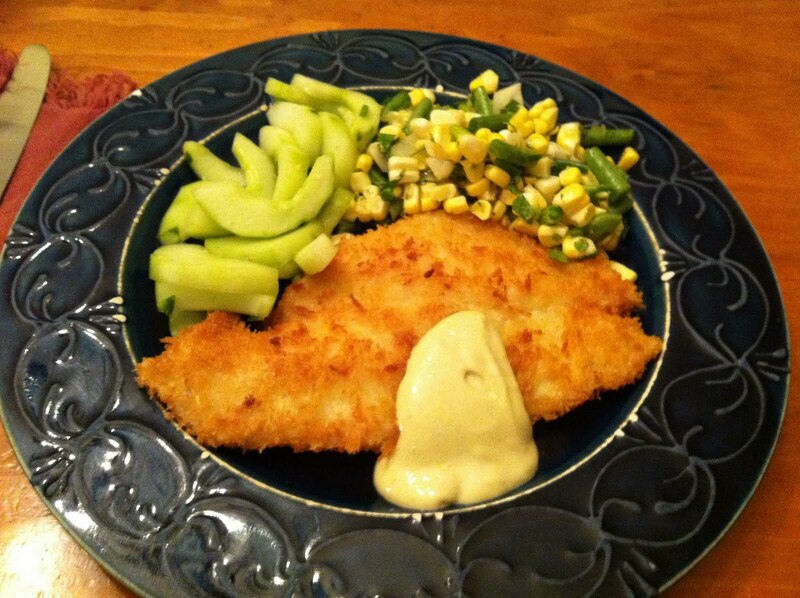 Don't get me wrong, I love my crispy panko coated flounder but what makes this dish special is the sauce. If you haven't discovered Sriracha chili garlic sauce already go out and get yourself a bottle immediately, it's available everywhere and easy to spot with its distinctive green top. I use it right out of the bottle on sandwiches, tacos, and eggs, in sauces, and as I did here, stirred together with some mayonnaise for an amazing condiment. Perfect for anything fried, even french fries. For the flounder I dusted each fillet with flour after sprinkling with salt and pepper, dipped them in egg, and then coated with panko before frying in a small amount of canola oil.